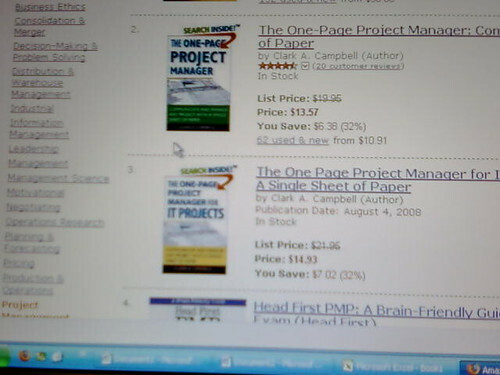 Yes, it’s a picture of my computer screen… but it shows the numbers 2 and 3 from Amazon.com’s page titled “The most popular items in Project Management. Updated hourly.” Those two books are both written by my dad, Clark. Rock on, Dad! May the One Page Project Manager continue to bring in the big bucks and pay for the hot tub electrical bill. I was trying to find my blog on google and found yours instead. I guess there is more than one “sciolist” in this world. What was the number #1 PM book on amazon? Was it Making Things Happen? That was the book they taught in my PM class.